Coloreel will demonstrate the many possibilities of the Coloreel unit at stand C42, Hall 5 at Texprocess show. The visitors will be able to watch the unit live and meet Coloreel distributors. In 2017 the company won the Texprocess Innovation Award for outstanding new technology. Now they return to the fair with the the Coloreel unit, this digital instant thread coloring product is fully industrialized and available to the market. 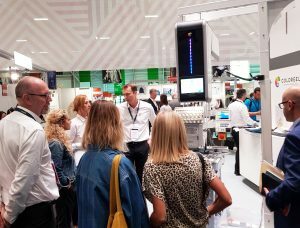 At the Coloreel stand, visitors will be able to experience live demonstrations of the thread coloring unit, producing uniquely colored embroideries never seen before. Coloreel will also explain how the technology and process work by showing the inside of the unit.